This section provides a demonstration of the time dilation phenomenon using a Minkowski diagram. Amy stays in frame moving at a speed of v=0.6*c relative to Bob's frame. Amy holds a clock in her frame at (0,0) as event O.
Amy waits for 4 seconds at arrives at event E, (X',cT')=(0,4). The elapsed time of E in Amy's frame is cT'=4 seconds. 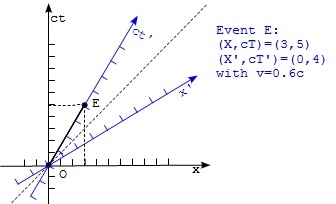 The event E would be observed at (X,cT)=(3,5) in Bob's frame based on the Minkowski diagram given below. The elapsed time of E in Bob's frame is cT=5 seconds. So the elapsed time in Amy's moving frame is dilated by cT/cT' = 5/4 = 1.25, which matches Lorentz factor of the time dilation formula presented earlier in the book.